Wow, the Cisco Catalyst 6800 Series Supervisor Engine 6T is here. It is the newest addition to the family of supervisor engines. 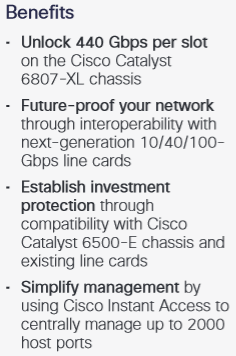 More powerful than the Supervisor Engine 2T, the Cisco Catalyst 6800 Supervisor Engine 6T integrates a high-performance 6-Terabit crossbar switch fabric that can enable 440-Gigabit switching capacity per slot on the Cisco Catalyst 6807-XL Chassis in active-standby mode. It’s also compatible with 6500-E chassis, existing line cards and the next-generation 10/40/100-Gbps line cards. The high-performance dual-core CPU allows you to manage 2000 Instant Access host ports. The forwarding engine on Supervisor Engine 6T is capable of delivering high-performance forwarding for Layer 2 and Layer 3 services. The rich feature set of Supervisor Engine 6T supports existing applications such as traditional IP forwarding, Layer 2 and Layer 3 Multiprotocol Label Switching (MPLS) VPNs, VPLS, MACSEC while supporting new features such as Instant Access, SGT, Hardware-Enabled BFD Offload, In-band Span and is UCI‑ready. A 2.5 GHz X86 dual-core CPU, which enhances your control plane scale for applications like Cisco Instant Access. Instant Access allows you to manage both your Cisco backbone and access networks centrally. Eight 10 Gigabit Ethernet and two 40 Gigabit Ethernet uplinks for high-bandwidth applications. 720 million packets per second of IPv4 forwarding performance. Support for Instant Access, VSS, Secure Gateway Tagging (SGT), MACsec, and hierarchical QoS on every switch port. Premium network security with TrustSec, SGT, Secure Group Access Control Lists (SGACL), and Network Address Translation (NAT) integrated with the Cisco Identity Services Engine (ISE). Flexible NetFlow for easy network resource monitoring and analytics.